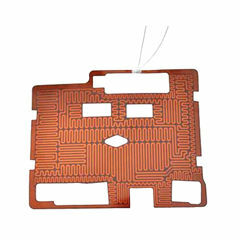 Polyimide (Kapton®) heaters manufactured by Sinomas are widely adopted for precision instrument heating up to 260°C. The versatile heater films have been the ultimate solution for many performance demanding applications. 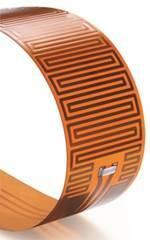 Polyimide (Kapton) heaters make use of very thin (e.g. 50μm) etched metal (usually nickel based alloy) foil as resistance element. The resistance pattern to be etched is designed in CAD and transferred to the foil, which is then processed through acid spray to produce the desired resistance pattern. Taking advantage of the etched foil technology, complicated thermal profiles and wide range of resistance can be realized. Bifilar circuit meander arrangement is possible, which is often required to eliminate the parasitic inductance in the circuit. Circuit design dual input voltage, multiple heat zone, low inductance design, etc. The maxmimum width of polyimide / kapton heater is only limited by the incoming roll of polyimide film. Henece there is no limit on one dimension. We can make wider heaters if the volume of demand is considerable. The maximum operation temperature depends on many factors. 260°C applys to Aluminum plated polyimide heaters without adhesive backing. Aluminum foil backing on polyimide heaters can improve the heat distribution and allows for higher watt density. For even high operation temperature and ems supression, Aluminum or copper plating of the polyimide heaters are recommended. The maximum operationtemperature of the heater can be up to 260°C. The technology has been used successfully on polyimide heaters for medical CT scanners, particle accelerators, etc. Medical diagnostic instruments: Heat sample trays, reagent bottles, CPAP ventilator humidifier, etc.